Do you ever lose articles of clothing? That you know for a fact aren't lost but simply misplaced? Does it take you ages to find them? When you're sure they're in the house but you have no idea where? If there answer to those questions were yes... Then we're definitely in the same boat and I have nothing else to add other than I miss this white blazer dearly and I have no idea where it is. 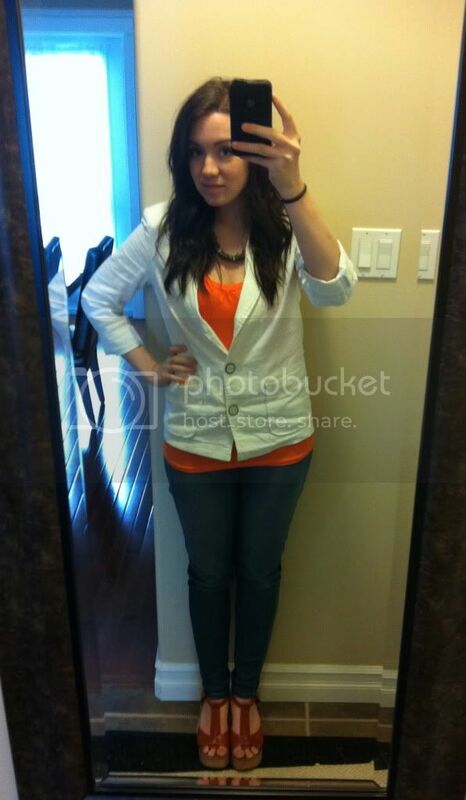 Outfit details: Levi skinny jeans; Blazer, Tank - Forever 21; Blowfish platforms - LuLu*s; Necklace - Smart Set. My heart is aching! I seriously wore this everyday for almost three weeks and I let my mother borrow it and I haven't seen it since. I know she put it somewhere in the house but I can't find it anywhere. Look at this snazzy mirror pic I sent to Mags one day. Maegan is my stylish best friend I sent pictures to almost every day before I decided I was going to start a blog. I didn't just send my outfits out to my friends; we sort of did an exchange to review the other's outfit. I actually really miss it. I'm trying to get her to guest post. Maybe she will if one of my comments hassle her ;) She is my biggest style inspiration! I hope my readers scroll down to my blogger inspiration post. I'm very serious in saying that Kendi's remixes and her philosophy on fashion is the most inspirational and empowering I've ever heard. Every girl should be reading her blog. Instead of pining after someone else's clothes, you end up coming back to your own closet feeling refreshed and looking with new eyes. It's great. I think I could ramble on all night, but I have chips to munch on and Criminal Minds to watch before snoozing time. Thank you for the comments I've been receiving. I've been looking at each and every one of your blogs as well and feeling very encouraged. I hate losing things! Especially clothes and accessories :( I hope you find it! I hope you find it...I am wondering if it fell off the hanger and it is bundled up in the very VERY back of your closet? Thank you for stopping by Bravoe! Glad you liked the dress! I am sorry to hear you misplaced your white blazer... it's so cute!! I hope you find it sooner rather than later (esp. for Fall!). I misplace clothes all the time and it is so frustrating. I always end up finding things behind the dryer (have you checked there) or under the bed because sometimes my cat does weird things. Also, I am a huge Kendi fan myself. I'm a new blogger, and she is what inspired me to start it. I'm almost done with my first 30-for-30! She is very inspirational; I've been following her for about 6 mos. and she just always looks fantastic. 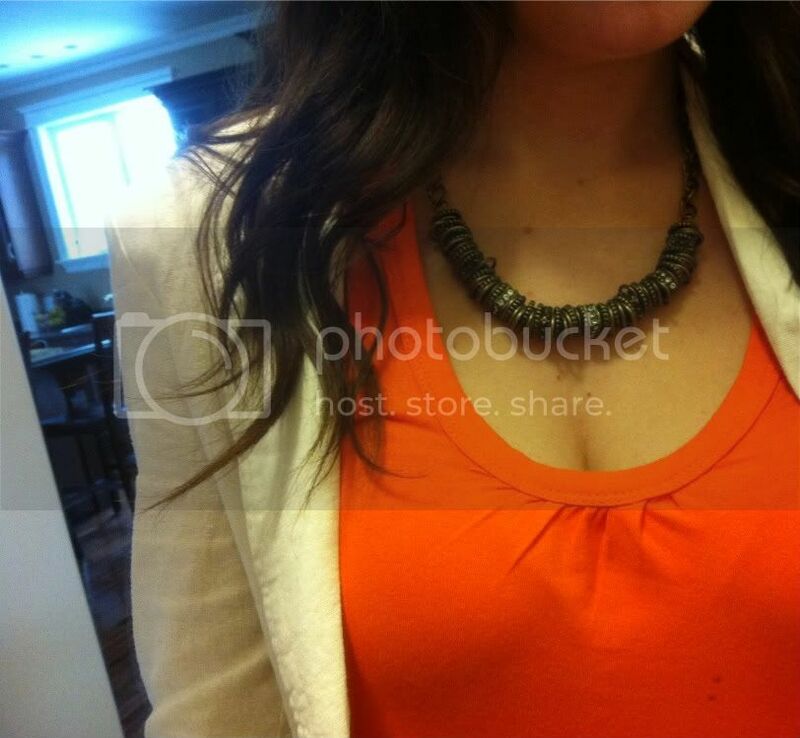 That's a great necklace. I love it! Those platforms are amazing ! !